Pictured 30 years ago is the Borough Rugby Club first XV before a game against Norwich. They won the match at Fengate 9-0 with a try by Dave Everitt against his former club and a conversion and penalty from Tim Meston. From the left are, back, Tim Meston, Dave Griffin, Graham Walker, Paul Freeman, David Hall, Ian French, Dave Everitt, Peter Hedges, Ian Fox, front, Dave Briggs, Mark Dickinson, Kevin Roe, Danny Kitching, Andy Croson, Alan Griffin and John Sismey. FOOTBALL: Peterborough League Premier Division title fancies Fletton suffered a first defeat of the season when losing 2-0 to Whittlesey United. Rob Speechley and Steve Phillips were the goalscorers. FOOTBALL: Italian hot-shot Mario Palazzo scored four goals for giant-killing Protelo in their 5-4 PFA Sunday Junior Cup win over Netherton Reserves. HOCKEY: Andrew Cave scored a hat-trick for City of Peterborough seconds in a 5-0 win over Old deFerrians while Graham Finding also hit a treble for the Vets in an 8-1 victory against Cambridge City Vets. RUGBY: Sam Crooks, Jonny Beale, Rob Hancock and James Crighton scored tries for the Borough Colts team in a 28-18 win over Market Harborough. JUDO: Veteran star Jenny Hussey, a 61 year-old grandmother from the Bushfield Judo Club, won the British Masters title. FOOTBALL: Donna Nicholls slammed a hat-trick for Peterborough Ladies in their 5-2 win over Barking in the Eastern Region Premier Division. FOOTBALL: Blackstones talented 18 year-old midfielder Dan Cotton signed for League Two side Boston United. SPEEDWAY: Ryan Sullivan was the star man for Panthers with 15 points as they beat Ipswich 54-42 in a British Premier League meeting at the Showground. Next best were Mario Jirout and Sam Tesar with 10 points. FOOTBALL: Wisbech moved to within one game of the FA Cup first round proper when beating East Thurrock 2-1 with goals by Peter Munns and Andy Sharman. FOOTBALL: PFA Senior Cup holders Ortonians just managed to edge past Wisbech Reseves in the first round. They won 4-1 on penalties after a goalless draw. James Horner, Lee Davison, Dean Peters and Darren Bradley scored in the shoot-out. CRICKET: Peterborough Town completed the clean sweep when beating Long Sutton by 31 runs to win the South Lincs League Premier Division title. They had already won the Northants League Premier Division and the Jaidka Cup. POSH: Barry Fry’s team went goal-crazy at London Road, smashing Wycombe Wanderers 6-3 in a Division Two game. Goalscorers were Sean Farrell (2), Greg Heald, Derek Payne, Ken Charlery and Simon Clark. BILLIARDS: Peterborough-based Mike Russell won the Gold Flake World Championship in Bombay and a winner’s cheque for £15,000 when beating Geet Sethi 2534-1848 in the final. RUGBY: Big Andy McGeown bulldozed his way in for five tries for Thorney in their 36-29 win over Northampton Heathens in the Courage League. POSH: Irish striker Nicky Houston scored all four goals for Posh Youths in a 4-1 win over Somersham in the Fenland Floodlit League. CRICKET: Town’s title-winning Saturday first team skipper Dominic Ralfs quit, blaming work and family commitments for his decision. Ajaz Akhtar took over. ICE HOCKEY: Peterborough Pirates scalped Crowtree Chiefs 20-14 in a Norwich Union Cup game. Garry Unger scored six times for Pirates with Tim Peacock and Todd Bidner both netting hat-tricks. CRICKET: Peterborough Town just missed out on the South Lincs League Premier Division title. They needed to win their last two games to become champions but could only manage winning draws against Burghley Park and Long Sutton. Skipper Alan Swann scored 121 not out against Burghley Park as Town amassed 224-0 with Pete Dale 78 not out. Burghley were 136-5 in reply. Against Long Sutton, Gary Rice hammered an unbeaten 59 out of Town’s 182-8 and Long Sutton replied with 127-2. North Runcton took the title. POSH: Les Lawrence, Dave Gregory and Bryn Gunn got the goals for John Wile’s side in a 3-1 win at Colchester. RUGBY: Mick Mason and Phil Branston both ran in for a hat-trick of tries as Baker Perkins seconds beat Wigston seconds 76-0. CRICKET: Melvyn Beck won Whittlesey Cricket Club’s single wicket competition for the third time - but it was his first success for 10 years. He beat Graham Wright in the final after disposing of the club’s top all-rounder Dave Wortley in the semi-finals. FOOTBALL: Former Posh player Mario Ippolito scored six times for ICA in a 14-0 win against Harrier in the Peterborough Sunday Afternoon League. HOCKEY: Peterborough Town beat Northampton Saints 3-1 with goals by Phil Webber (2) and Steve Gregory. GOLF: Peterborough Milton won the prestigious Hollingsworth Trophy competition. They beat Kettering 3-2 in the final thanks to wins by Brian West and Richard Cole (2&1), Ron Coltman and Jim Croll (5&3) and Tom Bowden and Steve Davies (2&1). HOCKEY: Kestrels hammered Perkins 7-2 at The Grange thanks to goals by Martin Campbell (2), Trevor Andrew (2), Kath Browning (2) and Ann Unwin. 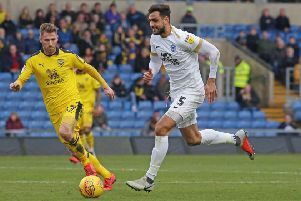 POSH: Manager Noel Cantwell experimented by playing centre-half Chris Turner up front for a Division Three game against high-flying Swindon and he scored the only goal of the game. HOCKEY: Peterborough Town began their Greene King Northern League Division One campaign with a thumping 6-0 win against Gorleston. Max Webb (2), Jimmy Wheeler, Rodney Edward, Tony Hansen and Duncan Parks got the goals. FOOTBALL: The Sunday Afternoon League match between Lincoln Road Venturers and Colombo was abandoned by referee Eric Jinks after an hour when a spectator ran onto the pitch and fighting broke out. FOOTBALL: Peterborough Sunday Afternoon League Premier Division title favourites Eye United smashed Stamford Tigers 5-1 with goals by Geoff Biggs (3), Nick Papworth and Dennis Wildman. POSH: Tony Cliss scored both goals as Posh Youths beat Chelsea 2-1 in a South East Counties League Cup match. FOOTBALL: There were FA Vase wins for Peterborough League sides Parson Drove and Peterborough Rovers. Drove beat Norfolk Senior League opponents Holt United 3-1 with goals by Clive Headland (2) and Jeff Martin while Rovers knocked out Leicestershire Senior League side Hillcroft 2-0 thanks to strikes by Glyn Tilbrook and Phil Walding. GOLF: Milton won the Hollingsworth Trophy for the first time, beating Rushden 3-2 thanks to wins by Robin Dennis/Clark McCrae, Richard Allan/Richard Butlin and Ray Beekie/John Lovesey.